Happy New Year! It’s always exciting starting the new year with ambitious plans to support FreeBSD in new and existing areas. We achieved our fundraising goal for 2018, so we plan on funding a lot of work this year! Though it’s the new year, this newsletter highlights some of the work we accomplished in December. We also put together a list of technologies and features we are considering supporting, and are looking for feedback on what users want to help inform our 2019 development plans. Our advocacy and education efforts are in full swing as we prepare for upcoming conferences including FOSDEM, SANOG33, and SCaLE. Finally, we created a year-end video to talk about the work we did in 2018. That in itself was an endeavor, so please take a few minutes to watch it! We’re working on improving the methods we use to inform the community on the work we are doing to support the Project, and are always open to feedback. Now, sit back, grab a refreshing beverage, and enjoy our newsletter! As the year wrapped up, we looked back at what we’ve accomplished in 2018. Work continues on some projects, such as online RAID-Z expansion, but we’re now starting to look ahead at the work we’ll sponsor in 2019. Some of the broad themes we’re investigating are described below. We need to prioritize and select individual projects, and welcome your feedback and project grant proposals. Over the past several years the Foundation funded several projects related to Capsicum, largely focused on the development of Capsicum itself. It now makes sense to focus on application of Capsicum to more software, both part of the base system and third-party. Additional Casper services may be developed to support application requirements. Work on a number of mitigations for kernel or userland application vulnerabilities is in progress, and these need to be completed and integrated. Support for automated code-coverage-driven system call fuzzing is also a work in progress. FreeBSD’s Continuous Integration (CI) system has become a very valuable component of the overall development environment, but there are also a lot of potential improvements. Increasing test coverage is an ongoing, incremental goal. Much of the CI-based test coverage is executed in virtual machines, but a small number of platforms perform full hardware system testing. Projects may add new CPU architectures and platform types to the hardware test lab. Data on CPU architecture and package popularity, and machine configurations, will allow FreeBSD developers, the Core Team, and the Foundation, to more effectively make decisions on hardware support. Projects could develop tools and systems to collect and report this data; of course it must be done in a transparent, opt-in fashion. Foundation-sponsored developers and others in the FreeBSD community have made great strides in continuing the migration to a modern, permissively-licensed tool chain over several years. There are a few tasks remaining, including retirement of the remaining GNU binary utilities, support for Link Time Optimization (LTO), and improvements to the ELF Tool Chain tools used by FreeBSD. Additionally, we can ensure that a broad collection of debugging/diagnostic tools (such as the LLVM sanitizers, and code coverage tools) work out of the box on FreeBSD. Developers in the FreeBSD community and developers under Foundation sponsorship have made significant improvements in addressing specific bottlenecks and limitations encountered when running FreeBSD on large thread count and NUMA systems. Projects may continue to identify problematic workloads and address issues found. FreeBSD runs well on a large number of CPU architectures, although peripheral support may be limited; in particular, FreeBSD lacks drivers for the full complement of devices on a number of popular embedded single board computers. There are also a number of CPU architectures of new or growing interest. Projects could improve general infrastructure and support for a CPU architecture such as AArch64, RISC-V, and Power. Many people consider servers when thinking of FreeBSD, but it is also important that FreeBSD continues to run well on client devices (laptops and desktops). This allows (or requires) developers to test their work as well as the work of others on an ongoing basis under a variety of usage conditions. In addition, technologies often transition from being perceived as relevant only to client devices to being a critical requirement for servers – for example, power management. Some specific projects in this category include improved FUSE support, Linuxulator improvements, Intel graphics support, WiFi improvements, 802.11ac support, and driver updates, and work to finish and integrate the packaged base effort. FreeBSD was an early pioneer in operating system-level virtualization, with the introduction of Jails. Significant developments in containerization have occurred on other operating systems since that time, with examples in Zones, Docker, and Kubernetes. There is now a large body of knowledge, process and context around these tools which largely excludes FreeBSD. Projects here could add FreeBSD support to these existing tools, or develop new tools or add features to FreeBSD to support these approaches. I look forward to hearing from you on which topics you feel are most important, and receiving project proposals to improve FreeBSD in 2019. From the bottom of my heart, I want to thank everyone who made a financial contribution to the FreeBSD Foundation in 2018! I’m thrilled to say that we raised over $1,332,398! Final numbers will be available by early February as we’re still receiving checks. The good news is that we can continue the level of support we provided in 2018, and increase support in a few areas like software development and advocacy/education. We are currently finalizing our 2019 plans and goals. Stay tuned to upcoming newsletters for more information. More software development projects to improve FreeBSD. We are currently funding a project to improve wifi on the Raspberry Pi, and another project to improve FreeBSD scalability and performance. In addition, we are currently reviewing project proposals for some useful features. FreeBSD workshops and presentations at upcoming conferences like FOSDEM, SCaLE, and SANOG33. Finally, we are also working on gathering more FreeBSD usage data and increasing FreeBSD exposure outside the community. In order to continue supporting FreeBSD at the level we do, we need more companies to step up and give a financial contribution. One of my goals in 2019, is to reach out to more companies earlier on with the aim of securing multi-year commitments, so we can continue adding resources where needed. You inspire us to work hard supporting FreeBSD and to share your work around the world. From contributors to users, we are here to support you. Please let us know what we can do to help. I look forward to meeting and talking with you this year! The FreeBSD Release Engineering team continued working on 12.0-RELEASE, with the official announcement of its availability sent December 11. The FreeBSD Release Engineering team would like to thank all of the developers for all of their hard work that went into this release, and everyone in the community that helped test during the cycle. Advocacy is a big part of our mission, and we dedicated a lot of time and funding to spreading the word about FreeBSD in 2018. From giving talks, and staffing tables to handing out flash drives preloaded with the latest release, the Foundation team promoted FreeBSD at 28 events all over the world. For the first time, the Foundation added a FreeBSD presence to All Things Open in Raleigh, North Carolina and we held a week long workshop in Tonga. As we begin 2019, we’d like to make a big announcement. Beginning with the January/February 2019 issue, the FreeBSD Journal will be freely available to everyone. Why, you might ask? A big part of the FreeBSD Foundation’s mission is to raise awareness of FreeBSD throughout the world. We know that the FreeBSD Journal is the best venue for keeping those interested in FreeBSD up-to-date. Our articles are timely and informative. Therefore, the Foundation has decided that the benefit of making it freely accessible to everyone will outweigh the cost of producing it. However, we will continue to accept donations if you’d like to help support the Journal. Thank you for your continued support of the FreeBSD Journal. We hope you enjoy the new enhanced edition. The Foundation is pleased to be again taking part in the Southern California Linux Expo (SCaLE). If you know someone looking to get started with FreeBSD, please tell them to check out the Friday workshop led by Roller Angel and the Foundation’s own Deb Goodkin at SCaLE 17x this year. Don’t forget to stop by the FreeBSD table in the Expo hall. SCaLE 17x takes place March 7-10, 2019 in Pasadena, CA. Rooms are selling out quickly. We hope to see you there! The November/December 2018 issue of the FreeBSD Journal is now available. 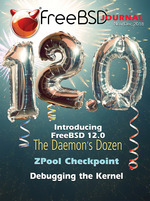 Don’t miss the issue introducing FreeBSD 12.0. XipLink specializes in optimizing wireless links, WANs, or any network that experiences high latency, asymmetric allocation or high bit error rates. XipLink’s solutions are seen mainly in satellite networks, aviation, military, government and maritime systems.